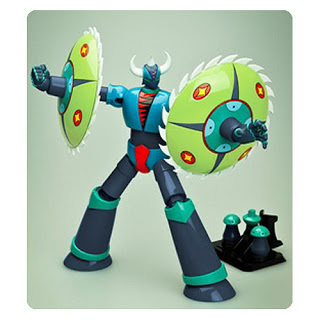 3-D Monster: Toy Robot Goodness! Dig those crazy saw blades! Geez, Entertainment Earth puts out some good stuff, don't they? Yup - I could drop some major coin at that shop! Me too. I wish I had room to put all that awesome stuff. The condo is kinda small. Hopefully when we move, we'll get a place with a room of geekery all for me! It does get tricky trying to collect stuff in a smaller place. Our condo is one bedroom...with only a kitchen, living room and bathroom. So there's like NO place for fun stuff. So when I buy cool stuff, it pretty much just goes into storage with the promise that someday, I will unleash it's true awesomeness into a room of it's own! I don't think I could live anywhere that toys and comics are not welcome. I think the wife and I are going to have to make some sort of compromise if I can't have my own space. Luckily, she really likes my vinyl stuff and my tin robots, so I think we'll be able to work something out! It's not so much that toys and comics aren't welcome.....it's more that the place is so small and the whole place has an old world European style to it. Unfortunately, random toys and stuff look really weird against that back drop. We tried it......looked way off. But we're trying to put it on the market.....so when we do move, I've been (more or less) guaranteed that I'll have a geek den all my own for toys, comics, video games and what not!